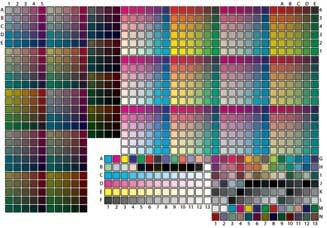 A color chart for calibrating and profiling printers. The IT8.7/3 specification defines two data sets. 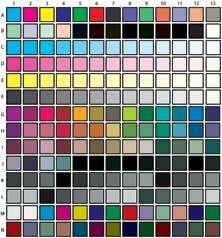 The Basic Ink Value Data Set consists of 182 patches. The Extended Data Set is 928 patches. The IT8.7 chart is to extract a large amount of data about the printer and ink/paper combination. Patches A1-A7 and B5-B13 provide information for the Neugebauer equations. Patches in rows A-J can be used for polynomial fitting functions for the tonal reproduction curves. The remainder of the chart can be used for calculating the results of adding black and improving the neutral reproduction. The Extended Set includes all the patches of the Basic Set. The additional 746 patches are usually used for creating lookup tables.